It’s super frustrating when I go to a restaurant and I’m starving and see someone else seated after me get served first. I’ve worked in a restaurant so I understand there are many reasons for this to happen. Usually it’s simply that your server secretly hates you and is trying to make you suffer. Steal his burger and shave his bowl (cut). Sorry about that. I have a faulty Malaprop circuit. I currently work in a restaurant. It could also be that you asked for too many changes to the plate, and the cooks hate you. 3)Bad server took too many orders at one time and got the order of the orders mixed up. 5) You were seated in the section of a different, less efficient (possibly new) or busier server than the other patron. I’m a hostess, and much as I try to keep the sections even, some patrons are adamant about getting a specific seat (window seats are popular despite the fact that the view is a parking lot and a freeway) which can overseat one server over another fairly quickly. And on a more related note – you should never feed a bieber to anyone before asking if they are allergic or hypersensitive to it. There’s a _lot_ of ppl out there with such a problem. And whatever you do, never feed a Bieber after mignight. Okay, I bite. 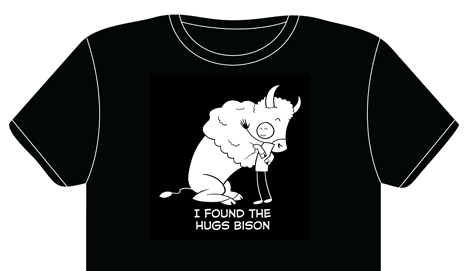 ORDERED SHIRT!!! 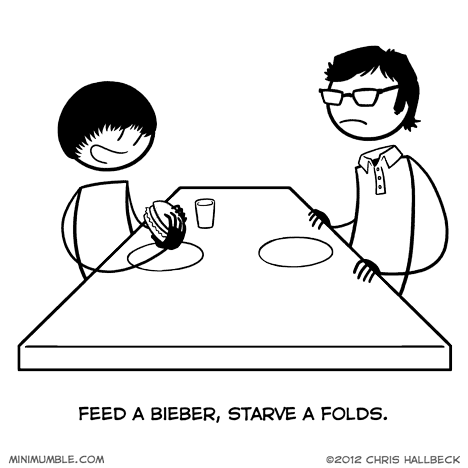 no, you’re supposed to starve beiber so he’ll die and we don’t have to listen to him anymore. dunno who folds is.